Mobile Inquirer has a strong following that keeps growing and growing, we inform ten’s of thousands of technology loving individuals, on a wide variety of mobile related topics each month. 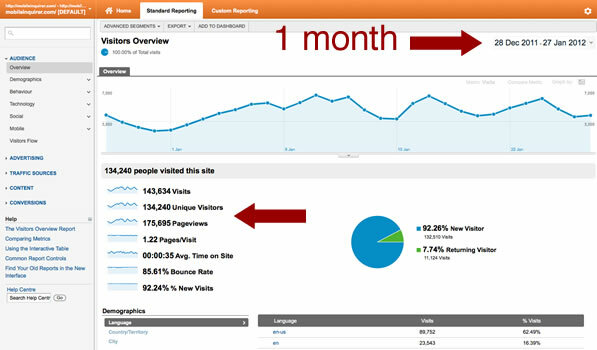 As of Early January 2012 we get over 160,000 pageviews per month and this is growing by around 10-20% per month. Our audience appears to consist of mainly male technology lovers, with plenty of disposable income, between the ages of 25-50. Please visit the link below to see what these visitors look like on an averaged out stat basis, please note that the Asian visitor statistic is not correct as you can see from the Google analytics snapshot above for country access data, but feel the rest may be closer to the truth. We are primarily visited from the US (63%) and UK (17%). We also find that many of our visitors are B2B type clients who work in related technology fields, and are looking for the next big thing in mobile tech or industry insights into marketing, technology and social media, whatever it is they are after, if it is mobile related, we usually cover it. Mobile Inquirer offer a few options when it comes to advertising, some of which are highly unique in nature. Quite simply go to our profile on BuySellAds and see which areas are available and purchase exactly what you need when you need it. If you wish us to review a product, please get in touch and let us know more. We promise to deliver honest and high quality reviews of all products and will always pass our final piece over for review by yourselves, we look forward to building lasting relationships with PR companies, manufacturers and retailers. Please contact us to discuss this area further. We are happy to discuss writing press releases that review your product or service. We will take as much information as we can and then deliver an honest high quality journalistic article that will get syndicated out to various websites socially and through our relationships with other bloggers where relevant and possible. This will improve the chances of the piece gaining maximum exposure for your service or product and is a very powerful way of obtaining highly targeted traffic with relatively low costs.